Born and raised on the sunny coast of Durban, Dr Govender was then offered the opportunity to study her Bachelor’s degree in Dentistry on the opposite coast, at the University of the Western Cape. She received both her BChD and PDD in aesthetic dentistry at the University of the Western Cape. She was a dentist at 2 Field Engineering Regiment military bases during her community service year. Dr Govender is registered with The Health Professions Council of South Africa (HPCSA), and is a member of the South African Dental Association (SADA). She completes many hours in continuing education each year to ensure that patients receive the most advanced treatment with the latest techniques. 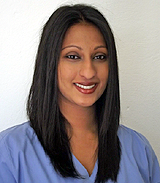 She not only loves her job but establishes long lasting relationships with her patients as well. Her hobbies include cooking, baking, sewing, mosaic … basically anything that she can get her hands on!